Goddesses and Sirens: Let her inner Bad Arse shine. Race: Why does the Japanese goddess, Amaterasu look like an English Rose (with sly lips)? Actually all the goddesses but three, Baba Yaga, Oya and Yemaya, look “white”. Obviously the Norse and Celtic goddesses are fine. It’s like Barbie in the 1980s, blonde or blonde, oh the variety. Again, the Greeks dominated about a quarter of this deck. 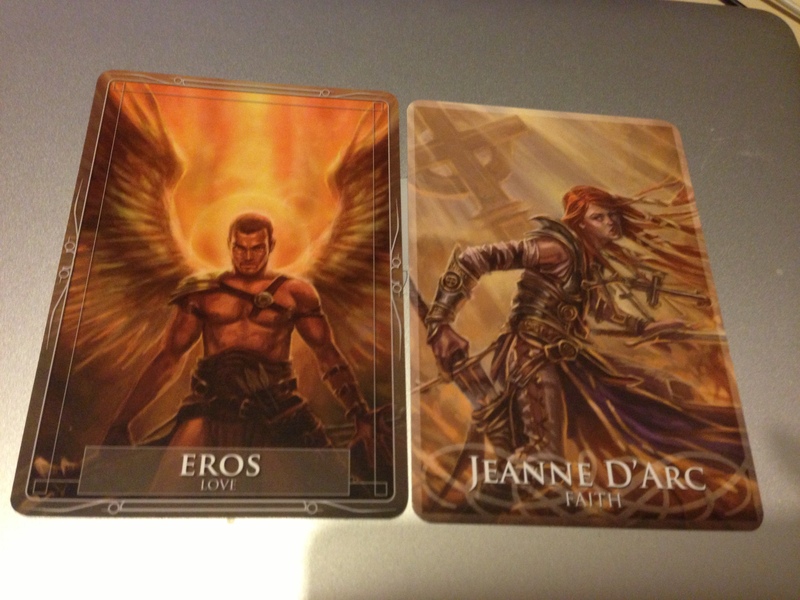 Joan of Arc/Boudicca: What in the name of goddess is a real life history personality doing in this deck? Questionably, Helen of Troy is included in this deck. If any woman is to be included “the face that launched a thousand ships” should be. However, she is just that – a woman. My mind is split, I watched a documentary a while back with the hypothesis that originally Helen was a goddess and history demoted her. Then there is Morgan Le Fae; how much nit picking do I plan on doing? Why wasn’t Merlin included in the masculine deck? – Not that I think he should be. That deck seems to stay true to the gods/titan’s theme. And why was Helen included and not Cassandra? It does my head in. While I am on a rant, where the bloody hell is Hel? Don’t give me “but she’s a giant”. I would have liked the inclusion of Frigg and other Germanic goddesses, no bias here. Even Diana would have been fantastic. There is plenty of material for a second deck – hint, hint. The accompanied guidebook is identical to Gods and Titans book; story, divination meaning and symbols, followed by an incantation/ritual. Not a bad little book. I also research whatever god/goddess I draw online, sometimes there are contradicting mythological stories. 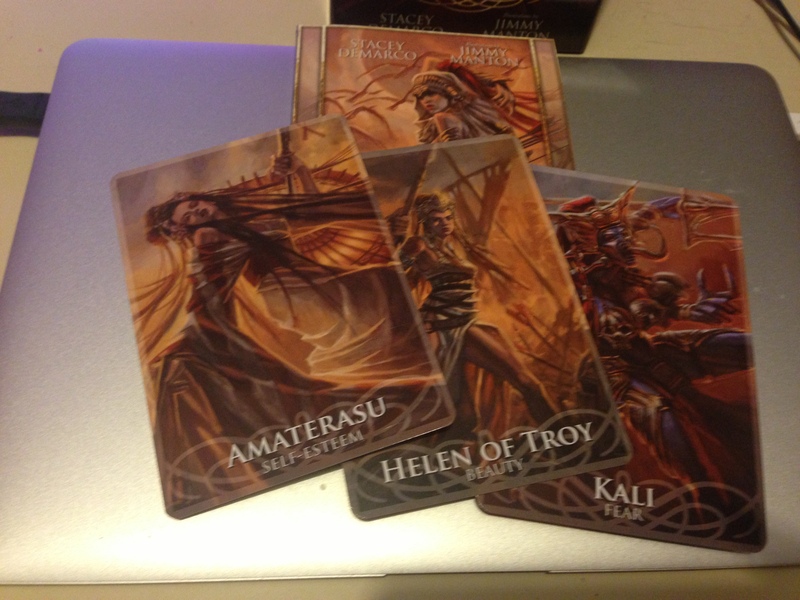 Goddess and Sirens can be used in conjunction with Gods and Titans for gender balance (note there are more cards, 1 or 2, in the goddess deck, then again there are slightly more woman in world – apparently). 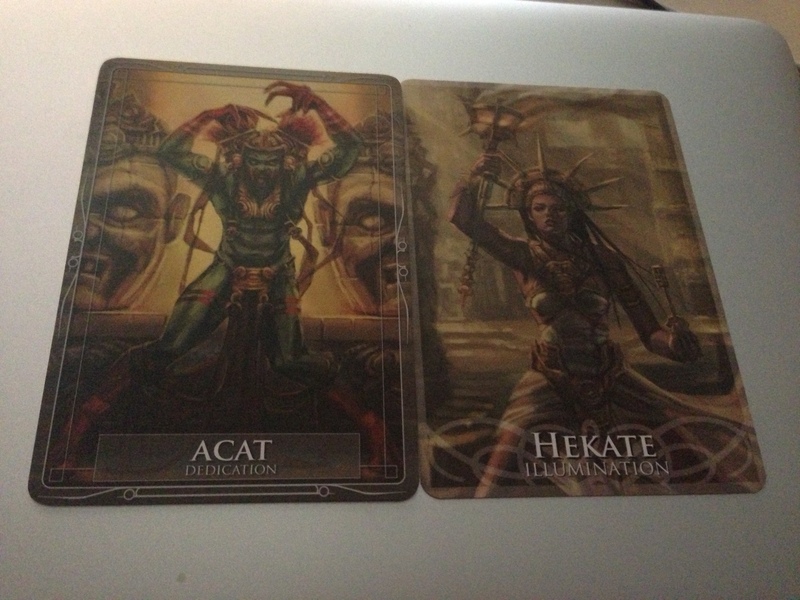 Draw a card from each deck to represent your character’s feminine and masculine sides. Ckate is an inspiring artist. Sometimes she goes a little crazy in her quest for artistic perfection. If it weren’t for the tattoos and piercing all over her body she would look feminine. She is intuitive by nature and often finishes other people’s sentences. This only fuels her crazy artist status, as people tend to think she creates wonderful things but isn’t quite right. The voices in her head dictate. Psychic or schizophrenic? Create a power couple by drawing a card from each deck. This super couple are as passionate as any couple can be. Both are fighting for freedom in their own way. Jeanne’s demanding job with the UN takes her all over the world away from Eros. Over time Eros feels like a neglected and desperate housewife. He needs some loving. A doting father, he feels he is doing it alone while Jeanne puts her passion for her job first. Don’t make Eros jealous; the green eyed monster will go to great lengths to protect his family, even if it requires drastic measures. While I don’t see all the goddesses and co being lean and mean, I find myself wondering if these imagines represent their shadow shelf. *** The creative suggestions on how to use these decks are my own.